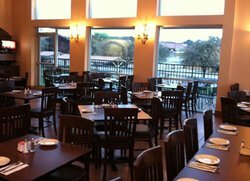 Zeytin Mediterranean Grill is a new Mediterranean/Turkish restaurant that opened this week in Las Colinas. Zeytin, which means "olive" in Turkish, is doing a cafeteria-style buffet on weekdays at lunch; and full-service, full-menu table service on nights and weekends. Owner Kemal Cenkci previously owned and operated Mediterranean and Turkish restaurants in San Antonio and Northern Virginia. "Our dishes are authentic and made from scratch," he said. "We have the gyro, which is well known and loved across the country, and authentic Turkish Doner Kebab, one of the few in the Dallas-Fort Worth area." He opened the Las Colinas spot three days ago in an area in Las Colinas that was surrounded by businesses as well as apartments and houses. "It's close to the new Irving Convention Center, too," he said. Cenkci, who's 55, moved to Dallas with his wife about a year ago so he could spend some time with his granddaughter. He opened the first Zeytin a few months ago in Grapevine, near Grapevine High School. The buffet is open Monday through Friday 11 a.m. to 2:30 p.m., and includes hummus, babaganoush, tabouli, fried eggplant, cauliflower, soups & salads, chicken and beef sauté, chicken curry, baked fish, gyro, and doner kebab and more. Menu items include beef, lamb, and chicken entrees, from shish kebabs to Iskender kebab, a Turkish specialty, and many vegetarian options. The menu includes other intriguing items such as Russian salad with "potatoes, Turkish pickles, sweet peas, carrots, spices, mayo," and "Icli kofte" -- ground meat, walnuts, parsley covered with cracked wheat, and deep-fried. The list of desserts goes beyond baklava and rice pudding to a pear filled with walnuts and served with wine sauce; "kazandibi," a Turkish flan; "supangle," a Turkish chocolate pudding baked and served with ice cream; and "kunefe," baked, shredded wheat and Turkish sweet cheese topped with walnuts, served hot. Hopefully Jayme Von Cupcake will be all over that.